Every second counts. It sounds cliche. The kind of advice or quote that you hear and appreciate, but maybe can’t completely grasp unless you’ve been directly effected. This entire season has been a season of seconds. A season of coming so close, but not quite close enough. A year of determination, perseverance, highs, lows, getting knocked down, and standing back up and dusting myself off. Those of you who have followed me over the past year know that I set a high goal for myself to earn my professional license in 2014. When I made this commitment I knew that I had a long way to go. I knew there would be a lot of hard work and sacrifice to follow. Some understandably doubted. Why wouldn’t they? I started in this sport 4 years ago with a 5:55 half Ironman. When I made my goal to earn an elite license I had never finished higher than 7th in my age group at a major USAT sanctioned race. I finished last season 45th in my age group and 205th Overall at the 70.3 Age Group World Championships in Vegas. All respectable in their own right, but nothing incredible. But nobody knows me better than I know myself. I knew I had potential to make the necessary improvements to achieve this goal. I knew it wouldn’t be easy, it wouldn’t be handed to me, it wouldn’t happen overnight, and I would need to suffer for a long time day in and day out to make this a reality. Early mornings, late nights, meticulous planning, hour after hour on a saddle, miles upon miles in my legs, and most of all working on my weaknesses and building a stronger mental capacity. This past winter I made a plan and decided to surround myself with individuals and businesses who would make me a better athlete. People who had similar goals and lifestyles. People who understood the sacrifices I needed to make and stood by me the entire way with support. At the end of the 2013 season I made a connection with Trek Stores of Madison and was fortunate to become an ambassador. Having the best bikes, support, and equipment in the cycling world has given me an advantage that has aided in numerous top amateur bike splits in major Ironman 70.3 events and USAT sanctioned events over this season. Trek Madison has supplied knowledge and mechanical assistance in times of need and they are overall just an excellent business full of incredible people who took a chance on a local amateur with a dream. Their support has allowed me to grow into a stronger cyclist over this season. In May of this year I drove across the US to St. George, Utah in hopes of a top 3 amateur finish, my first attempt at a pro license. Although I had one of my better races of the season, I came up short by 45 seconds. At the time it is completely devastating. I had come so far and gotten so close only to lose it all in the last mile. Needless to say, the 24 hour drive home was difficult. I spent a lot of time in my own head digesting what this meant. Trying to see the silver lining. Telling myself that everything happens for a reason, regardless of whether or not I understood that reason at the time. During that trip I learned a lot about myself as an athlete and person. I learned I am the one who defines success and failure for myself. I learned that although I fell short of my ultimate goal I still needed to take pride in the success I had accomplished. I needed to enjoy the journey. During that trip I was able to turn the result of the race into fuel for my fire. Besides, I knew that regardless of whether or not I earned a pro license that day, I wasn’t ready to race at that level. Upon my return I had continued training hard and focusing on my next opportunity, which would be Racine 70.3 in July. In the meantime, I raced a lot of the local racing scene for fun and to support some of the athletes I coach. My training volume steadily grew, and I was getting really fit. I consistently logged 20-22hrs of training time per week, with 12-14hrs in the saddle. A change in my diet yielded a lean body which was not only lighter but began to recover faster. My consistent and purposeful healthy eating habits began to benefit my training on a great level. The lighter body frame was hugely beneficial to my w/kg and my threshold pace. I was beginning to peak at the right time and felt good about my chances, even though Racine is a course that doesn’t play into my strengths at all. I went into that race feeling pretty fresh and for the most part injury free. A seasons worst swim performance set me back about 6 minutes to the top amateurs out of the water. I fought back with the 2nd fastest bike split and a decent run performance to earn 1st in my age group, but ultimately still fell short at 5th overall amateur. 2:30 back from an elite license. I once again was devastated. I had a terrible swim at the worst time possible. A normal swim for me and it may have been a different story. I let myself be upset for a while. I asked why. I analyzed until my head exploded. I even got a bit angry. In the end I found myself in a pool getting some instruction. Taking tips from experienced swimmers, talking to current Pros about their racing approach, trying to figure out why I struggle so much in the open water. It all once again became fuel. Next up I raced Age Group Nationals in Milwaukee, strictly because it is in my backyard. I knew the likelihood of a top finish was small at the olympic distance due to my swim. I just wanted to go out and race as hard as I could the entire time. I wanted to ride the edge of blowing up and see where that put me. I came away with a 54:31 (2nd fastest) 40k bike split followed by a 34:20 10k run after a mediocre swim. 13th overall and some confidence going into my final pro license attempt of the season, Timberman 70.3 in New Hampshire. My last elite license attempt for 2014. I entered this race late because of how things played out earlier in the year. I knew I had some good fitness but I also knew I was really ready for a break. My body was tired. I kept asking it to give me a little more each week and it was catching up to me. I went to Timberman with high hopes, but not completely sure how my residual fatigue would effect me. I knew that I would find out on the run. I packed up and settled in to a long 2 days of driving the 20 hours solo. This drive, although similar in duration, seemed way more difficult than the drive to St. George. I wouldn’t allow myself to think about the race too much in the days leading up. I didn’t want to over analyze the situation and create a self induced pressure to perform. Yeah, I knew it was likely the last chance in 2014 and I knew that I wasn’t in a great place before the start. These things scared me a bit, but I refused to dwell on them. I didn’t want to plant a seed of doubt in my head. I had to put to use all of my mental skills learned over the past year to trick myself into confidence. Before I knew it, it was race day. Time to seize the opportunity I had in front of me. I decided to approach the swim with more intensity than I have in the past. The main goal was to swim on the rivet and make sure I was swimming straight. I got out pretty well with my wave and felt good. Nothing too major to report here. I swam hard and although it wasn’t an amazing swim split I had taken 2.5 minutes off my Racine swim time. Onto the bike I knew I could really do some damage. I knew that the best approach for my strengths was to ride this course harder than I typically would approach a 70.3 bike. The course is rolling with some decent short climbs mixed in. Starting in the 3rd to last wave I had a lot of bike traffic to deal with early. I was able to avoid any major issues and just put my head down and focus on riding hard. Everything felt labored on the bike, but I was still able to produce my race target watts. The cooler temps allowed for a bit of wiggle room on my nutrition, which helped because I struggled to keep water down early. I ride a 54/39 and had mistakenly only brought an 11-23 cassette, so my climbing was a bit over geared. I did a lot more mashing than I like to during a triathlon, but that was my own error. I could tell I was riding really well based on previous year splits. Overall I felt that I had set myself up for the amateur win as I approached T2. My 2:13:55 bike split was good for the fastest amateur of the day and 3rd fastest including the professional field. After a typical T2 I head out to the run where I felt a solid 1:20-1:22 would be enough to get the job done. A quarter mile in I could really feel all of the fatigue from this year in my legs. It hurt. Bad. I had to promise myself in that moment that this was the last run for a while. I told myself just one more time and I would take a break. I needed to seize this opportunity right now. In moments like this you really need to dig deep. You have to make a conscious decision whether or not you are going to the well or if you are cashing it in. As I discussed before, quitting is not an option to me. And that doesn’t mean just finishing. Backing off, slowing down, settling, not riding that physical edge, that’s quitting. I didn’t drive all the way to the east coast to quit. I didn’t log 300 hours of saddle time to this point in 2014 to quit. I didn’t run track workouts, long runs, and struggle in the water to quit. Not now. So I did a Jens Voigt and told my legs to shut up. I told them they could rest later. I stayed in the moment and ran one step at a time. Each step I tried to make it hurt more. The run course was more difficult than I thought it would be. A couple hills mixed in required focus the whole way. Although it was labored, my pace wasn’t too bad. 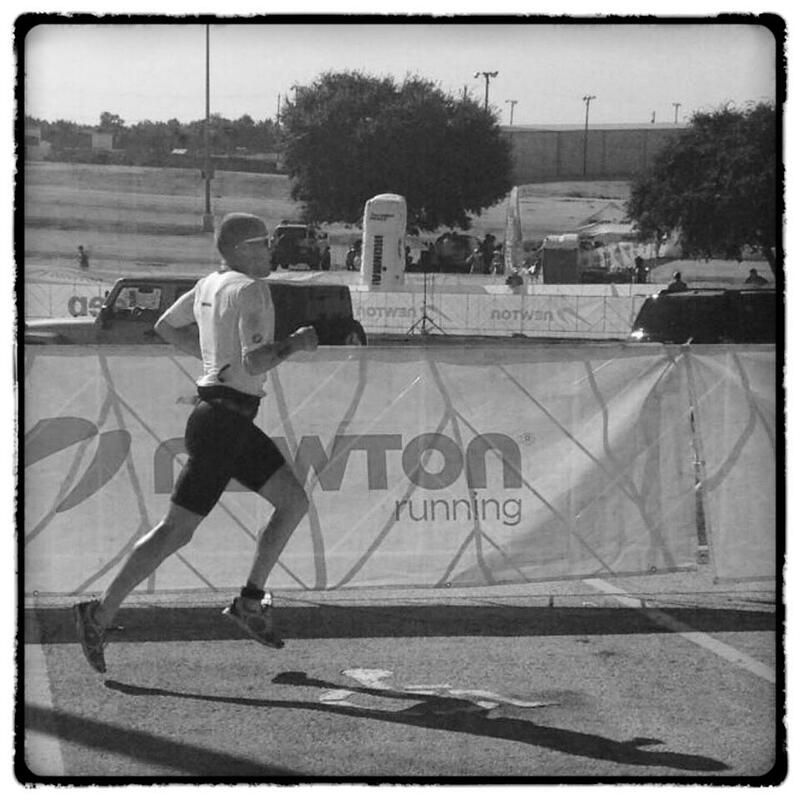 At the turn around I knew I was leading my age group by a decent margin, but had no idea where I was overall. I knew about what sort of finish time it would take based on past results. Mentally I had decided that I wouldn’t check my overall time until 5k to go. During the entire run I had a small rock in my left shoe under my pinky toe. At first I though maybe it was a blister. Then around mile 3 I could tell it was a rock because it moved. I thought to myself “just deal with the pain, you don’t have time to stop.” At mile 6 I thought “ok, stop, take it out, this hurts” but then quickly changed to “no, keep it, let it be there, maybe the pain from the rock is distracting your from the pain in your legs.” So I kept it. Finally around mile 9 enough was enough. I tried to lift the pace a bit more and the rock was really becoming painful. I stopped to take it out of my shoe. At 5k to go I looked at my watch and could see that I was in a pretty good spot. I knew that as long as I ran strong and didn’t blow up that I would likely be top 3. I dug really deep to keep going the last 5k. The hill at mile 11 was brutal. I almost cramped a few times so I was just focusing on keeping it together. When I hit the 12 mile marker I told myself that if I could run a sub 6 minute mile it would be enough. So I really forced the pace. I was able to run a 6:10 and I earned every second of it. As I rounded the corner to the finish line I could see the clock and realized if I ran hard I would be under 4:13 (because 4:12:59 is WAY better than 4:13:00) so I kicked it in to beat the unofficial clock. Official time 4:13:03. Upon my finish the announcer had stated that the top amateur time to that point was 4:16 something. I was ecstatic because I knew I had beaten that. As I began to walk away from the finish area I had a flood of emotions come over me. I thought about my first race. I thought about all the work, all the hours, the sacrifices. I thought about St. George and Racine. The failures and the successes. I felt like I had finally accomplished my goal. It was a lot to handle and I almost lost it. I quickly stopped myself because I couldn’t let it happen until it was official. There were still waves behind me and I hadn’t seen any results yet. When I finally was able to see results online I could see I was listed 2nd behind Chris Thomas who had a great race. Then as the later waves came through I was bumped down to 3rd by 30 seconds. Then. It. Happened. My name dropped to 4th. It couldn’t be, I thought. Not again. How? As I clicked into the name above me I noticed that we had recorded the same finish time. I had tied for 3rd. Tied! I was listed 4th amateur so I didn’t quite know what this meant. Would I still qualify? I was unsure and I wasn’t going to get any answers on Sunday. So I packed up and hit the road for home with a 1st AG, tie for 3rd amateur, and 10th overall finish. Yet I was disappointed. 1 second. I couldn’t shake it. 1 second can come from anywhere in a race this long. I thought about getting stuck behind slow people in T1. I thought about the bike traffic. I thought about the ROCK IN MY SHOE! I was frustrated with myself because I knew I didn’t race like every second counts. I was afraid I blew it. Honestly at that point, in my car with 20 hours left to drive home, I was done with triathlon for a while. I needed a mental and physical break before the race even started. Now it was worse. There was optimism though. A tie for 3rd is still third, right? It wasn’t cut and dry, but I had a chance. During the drive home Monday I was able to call USAT to get clarification. I was told by 2 separate USAT membership officials that they would honor the 3rd place tie and it would qualify me for my elite license. Instantly my mood changed from frustration to relief and excitement. My outlook changed from thinking of all the ways I lost 1 second to all the ways I gained 1 second. It’s funny how our success is truly defined by our perspective and perception. If I hadn’t ran hard to try and beat the unofficial clock I am not tied for 3rd, I am 4th. One second. It can come from anywhere. Every second counts. Friday I received official confirmation from USAT and I now hold an elite license. It’s surreal to me. It’s a realization of a dream that started over 4 years ago. I am extremely proud. I’m really allowing myself to step back and soak it in. For a lot of us in triathlon this is a challenge to do. We are always striving for the next PR, the next race, to go faster, to go longer. For right now I am enjoying this accomplishment. But I also have an understanding that this is not the end of the road. This is simply a new chapter. I have a lot of improving to do to be competitive. I still have high goals, but they are new goals. I’m not settling. I’m not getting comfortable or content. In fact, I am more motivated now than I have ever been. I still feel I have something to prove. Just like I went from 5:55 for a 70.3 to multiple top 5 amateur finishes I will continue to progress in triathlon and build my career to succeed. I define my success. And I have set the bar high. But I know as well as anyone, one step at a time. It’s a process. In closing of this post I want to say something that probably will come across as soft and sentimental, but I don’t care. Never give up on a dream. If you want it bad enough you can have it. Nothing worth having comes easy. Nothing. You have to fight for it. Day in and day out. There will always be doubters, haters, people who may even laugh. You have to shake them off and know that the people in your life who truly matter will support you. They will treat your goals and dreams as their own. I’ve been told to my face that I will never become a professional triathlete. It hurt pretty bad. In fact, at the time I asked myself if they were right. But I didn’t quit. I found a way to always turn the negativity, the doubts, and all my failures into fuel. When I’m on a trainer in the winter staring at a wall for hours on end destroying myself, I keep going because of them. To prove them wrong. To prove myself right. To make my believers and supporters proud. I’m proof that it can be done. If you want it, take it. Don’t wait for it to happen because it won’t. Every second counts. Thank you all for following along this journey so far. Here’s to the next chapter! I have been MIA from this blog since mid June. It has been a busy last few months between training, racing, coaching, building a business, and life. I’m happy to report that all of those things have been going pretty well. Finding a balance between all of these things can be pretty tricky. It takes practice and a conscious awareness of your time management. I am definitely not the best at it, but everyday I strive to do a little better. I focus on what I can control and forget about the things I can not. That seems to work pretty well. Anyways, I wanted to do some short recaps of my racing and training since Elkhart Lake in June. A lot has happened. Some milestones were reached. A few goals accomplished, a couple goals missed, and a continued motivation and spark created. I went into this race coming off of the biggest 3 week training block of my life. In the 10 days leading up to race day I had about 500 hard bike miles in my legs, on top of my normal swim and run load. I did this on purpose for the bigger picture of where I want to be this season. In fact, I registered for this race 2 days prior because I thought it was a good chance at making a little money thanks to Rev3’s amateur prize purse. I also knew that although physically it would be a struggle the day would really become a mental challenge. It was a mental test. How far can I push myself? Would I fold? Would I let the excuses dictate my effort? The course is brutal. BRUTAL. The last 5k of the run will test every fiber of your will. The quick recap- I had an ok swim. A bit difficult to stay straight on the way back in the swim. I can out of the water about 5 minutes or so off the front guys. From that point I hit the bike and knew I would need to fight for it all day. My IF came out low on the day at .78, but I still rode the 2nd fastest split, so I was happy. I was able to catch the 12 or so guys in front of me and come off the bike with a 6 min gap to 3rd. Ryan Giuliano was well ahead after a solid bike. He was also running really well. You never know what will happen in a 70.3 so I kept the foot on the gas on the run. At the halfway I could see Ryan extended the lead and looked comfortable. It was his race to lose, and he did not. He had a very impressive day on that course for an easy win. Meanwhile I had the hardest last 5k of my life. It was my physical ability vs my mental strength. I was right on the edge of how far I could push and every time I stepped over things got blurry. I probably ran over 7:00/mile for the last 3. It was all I had. With half of a mile to go I looked over my shoulder an thought I saw someone catching me. This scared me into action and I ignored all warning signs and pushed as hard as I could to the finish. As soon as I crossed my brain and body turned off. I went down. Hard. That day I found a new level that I can take my body. I broke through more mental barriers and pushed my edge out a bit farther. 2nd place got me a little money, but a lot of confidence. Sprint tri. All out the whole time. I was able to win by 4 minutes and felt pretty good about my fitness heading into Racine. It was a very well run event by RDE. A fun and fast course. Racine was my “A” race of the mid year. I had a goal to be in the top 3 amateurs overall. This was my 5th time racing Racine and I had never raced well here. This year I knew would be different because my fitness and mental edge was at an all time high. The competition looked pretty strong, especially in the 35-39 AG with Stubleski, Burke, Zucco, Hammond, Iott, etc. These are some pretty big names with a lot of big accomplishments under their belt during their racing career. Recap- I had a terrible swim. It was 3-4mins slower than I have been swimming all season. I felt good in the water. I was with a large group and thought we were moving faster than 34:00. Upon review of my data it seems that I swam an extra 250 meters or so, which would account for the extra 4 minutes. I had some gradual drift between each buoy that began to add up. I exited the water having given the main contenders a 5-6 minute head start. Onto the bike I knew right away it would be a good day. I really forced myself to be conservative. I wanted to unleash on the bike to make up time from my swim, but I also knew that this race is typically won on the run. So I held back and worked on staying efficient and aero. Racine is fairly flat, but technical with a lot of 90 degree turns. I executed my plan perfectly on the day and came away with the 2nd fastest amateur bike split at 2:12, 25.35mph. I hit the run knowing that despite my swim I was setup with a chance at top 3 if I could run sub 1:20. My plan for the first 10k was to be very controlled. I felt really good and could tell the conservative bike was a great plan. I cruised through the first 7 miles at 6:00/mile avg. At the short steep hill from the beach things started to hurt. After the course flattened back out the pain stayed, the effort became labored, and the pace began to drop. My 6:00 miles gradually became 6:15, then 6:30. Some GI issues required a porta stop with 6k to go. From there to the finish I gave every ounce of effort I had. I took what my body would give me and constantly tried to push it a little farther. The last 2k was one of those moments you hardly remember when it’s all over. I was yelling at myself, slapping myself, screaming the occasion F bomb which I felt really bad about. My body wanted to quit. My mind wanted to go harder. I could not get myself to suffer the same way I could at Rev3, but I definitely left it all out there. With the slower last 10k I ran a 1:23 half. I needed that 1:20. Maybe it was nutritional, maybe not. I hate the nutrition excuse because most athletes use it as a denial for the real issue, which is typically fitness or execution. But in this case I had a sloshy GI the entire run. I won’t go into detail, but I was not absorbing fluids and nutrients the way I should. It showed. As soon as I crossed the line I knew my race wasn’t enough for top 3. No one had told me. I didn’t even know my time. I just knew. You can’t have bad swims, make mistakes, or fade on the run and expect to beat these fast 35-39 guys. I ended up a little over 2 mins back of top 3. All 4 amateurs ahead of me were 35-39. Although I was disappointed to fall short of my goal, I still won my age group and the guys in front of me are really really fast and experienced. It took a day or 2 but I was able to see the silver lining. Regardless of whether or not I run a bit faster and finish top 3 my swim is where the time is lost. 34 minutes is not going to cut it. Not as an amateur and definitely not in the pro field. I’m still waiting for that moment of clarity in the water. The moment it all clicks. This was my first road race. This year I joined with a local strong cycling team, the Great Dane Velo Club. They have a lot of strong and experienced riders who are also cool guys who are willing to share their knowledge and help us learn the world of cycling. 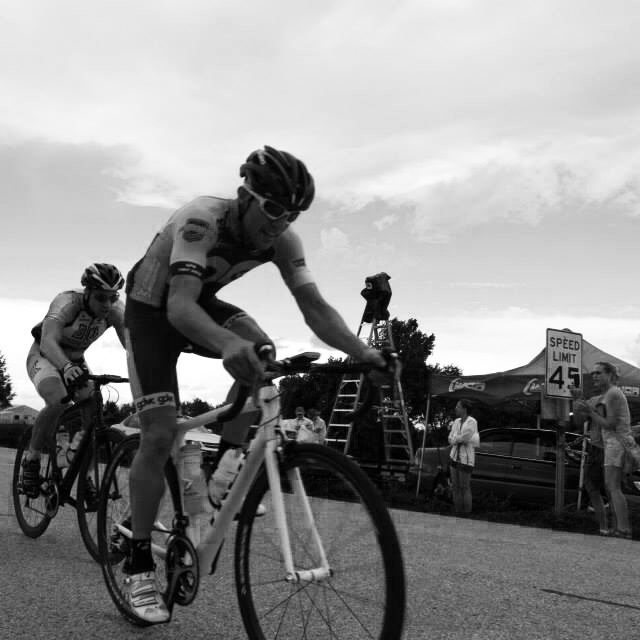 The Cat 3 race was 45 miles of rolling terrain with a short but steep climb at the end of every 6.5 mile loop. After talking with the team director, John Kunert, I knew that my plan would be to go off the front at some point and put down a TT effort to try and win. That strategy would play to my strengths. In the cat 3 race we had a few strong guys who were willing to do their part in helping our teammate Dave Blodgett who was the current State Omnium leader secure that win. They also knew that I would likely try to hold a break, and they were not going to help the group organize and try and bring me back. It takes a lot of discipline and self sacrifice to race for another guy. Tyler Giese, Mike Swart, and Blodgett all played a huge role in my success in this race. After 2 laps Mike put a move on at the front during a crosswind section that started to break up the group. Then Dave and I really worked hard at the front to reduce the field down to 10-12 guys. 4 of them were GDVC. Then Dave told the rest of the field to start working. A few guys came to the front and some stayed back, probably trying to recover from the previous move. After a couple pulls through I was sitting 2nd wheel for a bit behind a Brazen Dropouts rider. When I pulled through I looked back and saw that the we had a gap. All 3 GDVC guys were sitting at the front, slowing down the chase, and letting the gap open. The break was set. The chips were down. It was WAY earlier than I wanted to go, but I couldn’t waste the sacrifice the team made for me. So I looked at the guy with me and asked “can you climb?” he said yes, so I said, “well, I guess we are doing this!” We really pushed the effort for the next 2 laps. I could tell that the gap to the main chase was getting pretty big but I didn’t want to settle because I didn’t know how long it would be before they organized and tried to chase. The guy I was working with was struggling quite a bit, but I felt that I needed to keep him around because of the strong crosswinds. This means I did most of the work. And I was ok with that. At the time I thought it would pay off. All I asked was for a handful of 30s pulls from him so I could settle the HR and go again. There were many times over the last 4 laps that I thought he was going to blow up, but I didn’t make a move. In hindsight, on the final lap I should’ve probably hugged the edge of the road on the crosswind section where he couldn’t find the draft and maybe lost him. For some reason I thought he would be toast for the final climb so I didn’t do that. I made am attempt at a move with 3 miles to go but couldn’t hold it. That was when I felt the fatigue from all the work set in. I knew I was in trouble for the final climb. And I was. My legs have NEVER felt like that on the bike before. There were bricks in my shoes. He rode away and I couldn’t even respond. My focus was on simply getting up the hill. I crossed in 2nd. Meanwhile, the GDVC guys in the chase did exactly what was needed and set up Blodgett for a final hill attack for 4th place, securing him the Omnium State title. Congrats to him, and thanks to Mike and Tyler. I went in to AGNats with no pressure or expectations. The olympic distance is easily not my strength. The swim % is too high for me to really do well. There isn’t enough time on the bike or run to make up the 4 minutes I lose in the 1500m swim. I didn’t taper or really specifically prepare for this race. I did it simply because it was in Milwaukee and it is was a pretty awesome event. USAT does a good job. It was also a chance to see how hard I could race at this distance. I went in with the mindset to approach it like a sprint. Swim all out. Bike all out. Run as fast as I could. Volume is not my limiter and my experience is getting high enough that I can race at a high intensity for a long time. I wanted to see if I could still run fast off of a really hard bike effort. Recap- the swim was a battle. I haven’t been knocked around that much in a swim ever. A couple hits to the head and a gulp of water in the early part of the race cause a little bit of anxiety, but I quickly recovered and focused on swimming on the rivet, which is my weakness. I have trouble suffering in the water. I can’t get there for very long. I’m really working on swimming uncomfortably and I am gradually improving. Out of the water in 23:30 matches my best Olympic swim PR. I hit the bike and it was complete focus. Time to suffer. I never backed off. I regularly forced bigger gears to make sure the pressure was on. I biked like I didn’t have to run and I was moving pretty well. I moved up from 68th on my AG to 5th. As I was approaching the dismount my water bottle popped out and rolled under the barriers. I had to get off my bike, lean it against the barrier and run to get it to avoid an abandoning equipment penalty. This probably cost me 20 seconds or so before I ran across the timing mat. My 40k bike split recorded at 54:31, 27.3mph, 2nd fastest of the day overall (my garmin has 54:10 stopping it before the mishap). 3 seconds slower than the fastest. Hard to swallow that one with my bottle issue. Either way, it was a solid ride for me and I had put myself back into the AG mix. Onto the run I didn’t know what to expect. The legs actually felt really good. I ran controlled to the first turn and could see a few AG guys within reach. Around mile 3 I was passed by a guy in my AG who was running the fastest 10k of the day at 32:55. I kept him close but he was running strong. With 2 miles to go I committed to running the hardest 2 miles I have ever run. I really pushed the effort and ran down 2 more AG guys before the finish. This gave me a 34:24 10k run, 5:32/mile and the 9th overall fastest run of the day. I was able to crawl into 4th place in my AG and 13th place overall in what a lot of people say is the most competitive amateur olympic distance race in the country. I was extremely happy to go 1:55:48 at this distance and have my name near the top with some fantastic olympic distance triathletes. My bike/run combo was only bested by the National Champion Steven Mantell who had a great performance. And once again reminding me that it all boils down to me improving my swim. That’s the recap. Woah. A lot there. 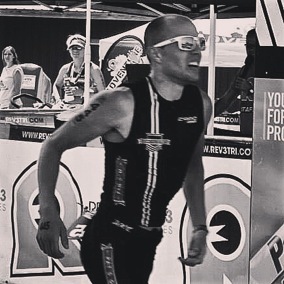 Next up I am heading to New Hampshire for the Timberman 70.3 this Sunday. Once again going for a top 3 amateur spot. I’m looking forward to this race. The venue sounds incredible and the course really plays into my strengths.